I was asked to bring a simple game to an upcoming Harvest Party. My kids, who are quite obviously "deprived," still enjoy the old-fashioned pastime of dropping clothespins through the mouth of a bottle. For our fall twist, we're turning clothespins into little acorn people and dropping them into a pumpkin. This activity has entertained them three-fold: an all-afternoon hunt for acorn caps, the subsequent mess of glue at the kitchen table, and finally, the game itself. Dollar Tree sells a 20-pack of wooden clothespins for $1. These would also be great for tabletop clothespin bowling. Our cub scouts love this with clothes pins and tennis balls. yay for "deprived" children : ) Such a cute craft. I am still amazed that Hide-n-Seek keeps my pre-teen and teen happy when visitors come over. 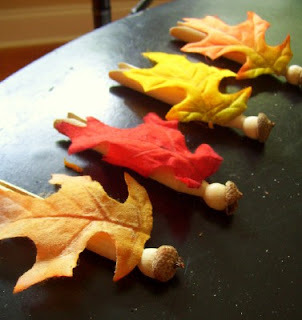 This is so cute - I love fall party ideas for kids that are inexpensive, easy, and worth saving. I hope you don't mind but I've borrowed your idea for a napkin ring craft! I've pointed your way too!